The internet and cell phones have infiltrated every cranny of American workplaces, and digital technology has transformed vast numbers of American jobs. Work done in the most sophisticated scientific enterprises, entirely new technology businesses, the extensive array of knowledge and media endeavors, the places where crops are grown, the factory floor, and even mom-and-pop stores has been reshaped by new pathways to information and new avenues of selling goods and services. For most office workers now, life on the job means life online. Pew Research surveyed online a representative sample of adult internet users and asked those who have jobs a series of questions about the role of digital technology in their work lives. This is not a sample representative of all workers. It covers online adults who also have full- or part-time jobs in any capacity.1 The most recent survey data from Pew Research in late 2013 shows that 94% of jobholders are internet users and they work in all kinds of enterprises from technology companies to non-technology firms; from big corporations to small proprietor operations; and from those in urban areas, farms, and places in between. Some of the key findings are highlighted below. 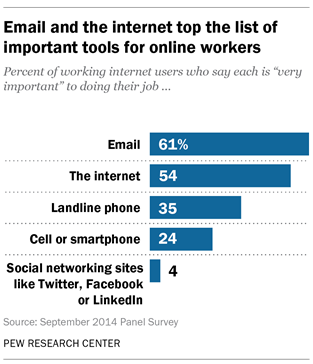 Email and the internet are deemed the most important communications and information tools among online workers. The high value of email comes despite the challenges of the past generation, including threats like spam and phishing and competitors like social media and texting. Surprisingly, landline phones outrank cell phones for these internet-using workers. Social media is very low in importance. In this sample, email and the internet are particularly important to adults who work in traditionally “white collar,” office-based occupations such as professionals, executives, managers, business owners, and clerical workers. They are also critical for the 59% of employed online adults who take their jobs outside of the physical boundaries of the workplace at least occasionally. What is potentially surprising is that even in the face of constantly evolving forms of digital communication, potential threats like phishing, hacking and spam, and dire warnings about lost productivity and email overuse, email continues to be the main digital artery that workers believe is important to their jobs. Since taking hold a generation ago, email has not loosened its grip on the American workplace. While commentators worry that digital tools can be a distraction in the workplace, many online workers say that is not the case when it comes to their productivity. Just 7% of working online adults feel their productivity has dropped because of the internet, email and cell phones, while 46% feel more productive. Expand the number of people outside of their company they communicate with—51% of these internet-using workers say this. Allow them more flexibility in the hours they work—39% of online workers say this. Increase the amount of hours they work—35% of online workers say this. Each of these effects is felt more among Office-Based workers than among traditionally blue collar, Non-Office-Based employees. Employers are likewise changing practices regarding employees’ use of the internet. Just under half of those surveyed say their employer blocks access to certain websites (46%) and has rules about what employees can say or post online (46%). The latter figure has more than doubled since Pew Research began asking about company rules about employees’ online presentation in 2006. Blocked access to websites and rules about employees’ online postings are more common for those working in Office-Based professions. In contrast, among workers in traditionally Non-Office-Based professions such as service, skilled and semi-skilled positions, fairly high percentages say they are not sure if their employer controls employees’ website access (29%) or has rules about what employees do online (35%). The analysis in this report is based on an online probability survey conducted September 12-18, 2014 among a sample of 1,066 adult internet users, 18 years of age or older. The survey included 535 adults employed full-time or part-time, who are the basis of this report. The survey was conducted in English by the GfK Group using KnowledgePanel, its nationally representative online research panel. Sampling error for the subsample of 535 working adults is plus or minus 4.9 percentage points at the 95% level of confidence. For more information on the GfK Privacy Panel, please see the Methods section at the end of this report.